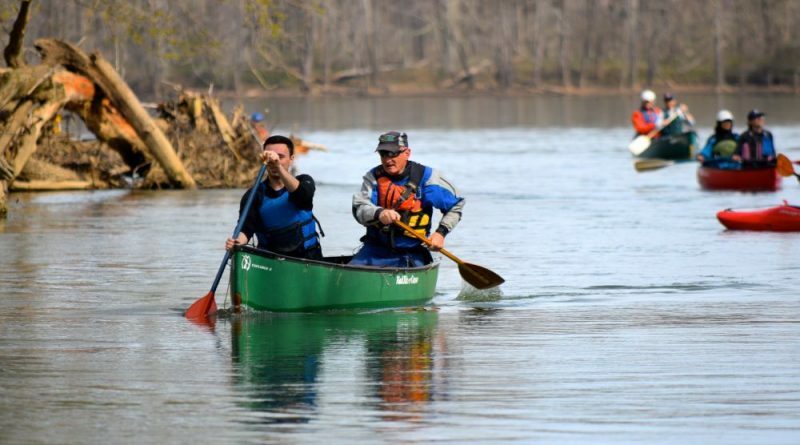 The federal government recently eased boating restrictions in the Potomac River, prompting a crowd of canoers and kayakers to celebrate with a day on the water. Ten canoers and three kayakers from the Canoe Cruisers Association of Greater Washington, DC, took a self-proclaimed victory ride along the Potomac River on Thursday morning to celebrate their success in a lawsuit that saw the U.S. Department of Homeland Security and the U.S. Coast Guard relax a security zone that previously restricted access to the river along a two-mile stretch in front of Trump National Golf Club when President Donald Trump and other high-ranking government officials are visiting there. The river-goers launched at Violette’s Lock in Seneca, MD, crossed the half-mile-wide river to the eastern edge of the golf club and then rowed and paddled about four miles downstream along the George Washington Canal. The association’s victory came two weeks ago, when the Coast Guard and department published an interim rule allowing for boaters to use the river in front of the 800-acre golf club during events when Trump and others who are protected by the United States Secret Service are present as long as they do so within a 250-yard-wide transit lane along the Maryland shoreline. That action came after a yearlong legal battle in the U.S. District Court for the District of Maryland. 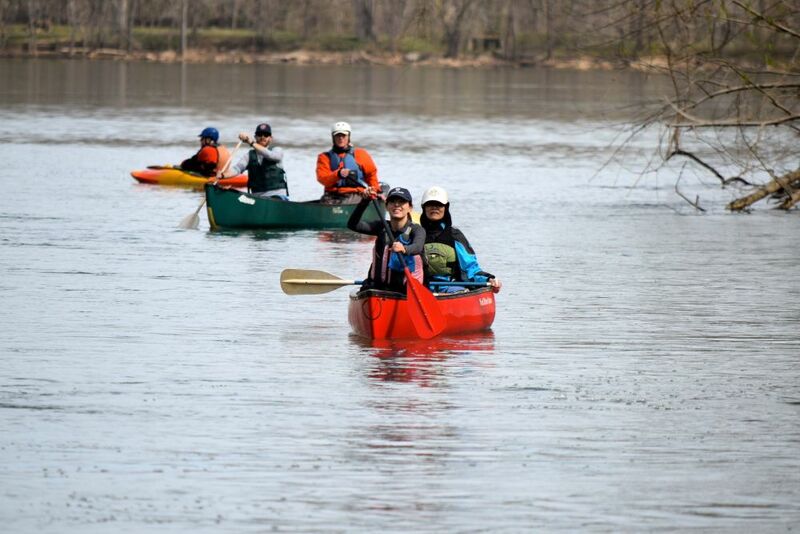 Paddlers and rowers from the Canoe Cruisers Association of Greater Washington, DC, took a victory ride along the Potomac River this morning to celebrate a relaxed security zone near Trump National Golf Club. Barb Brown, the chairwoman of the Canoe Cruisers Association, said she knows of Trump having visited his golf club 53 times in the past two years—visits she said caused “a lot of disruption” because they came mainly on weekends at the height of the recreation season. Unlike what the government has done in the past—establishing temporary security zones effective only for the duration of individual events—the July 2017 permanent security zone created that the government could activate at will without public notice. The zone affected many local organizations, as seen by the 633 comments posted on the Federal Register. 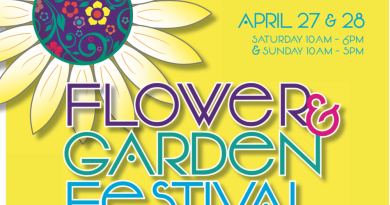 One of those came from Matt Markoff, the executive director of Calleva, a summer camp that sits directly across the Potomac from the golf club. Markoff noted that without access the river, his camp could have lost $14,000 for each cancelled day of camps during the week and $2,800 on Sundays for other classes. “I understand it is far easier to just shut everything down, but this would be extremely impactful to our entire organization,” he wrote. After reviewing 636 public comments, the department on March 21 modified the rule to reduce the overall length of the previous permanent security zone by about 350 feet on the eastern side of the golf club and about 1,400 feet on the western side, which allowed for increased river access from Algonkian Park in Loudoun. The modification also formalized a 250-yard-wide transit lane to give boaters access to the river in front of the golf club along the Maryland banks, keeping them at least 1,000 feet away from the club.